Racers score NASTAR Team Points based on the handicap they earn in their age, gender and discipline group. The maximum number of points possible is 10 and a minimum of one point is scored for completing the course. NASTAR Team Races are scored by adding the team's points and dividing by the number of scoring team members. For example, at the Regional Championship we allow eight people per Friends Team but only the top four scores are used to calculate the Teams' results. Family Teams must have a minimum of three racers and there is no maximum number of family members that can be on the team, but there must be a direct family connection. The three high point gainers contribute to the team score. 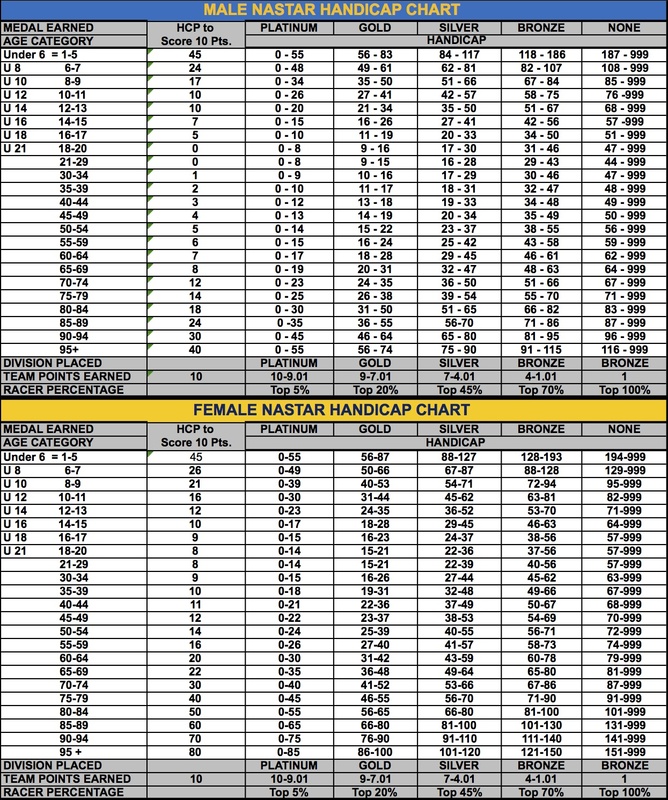 The NASTAR Handicap Chart provides young and old, female or male racers with an equal opportunity to contribute to their team. The first column on the Handicap Chart shows the age group and the second column shows the minimum handicap needed to score maximum of 10 team points. For example, a 13 year-old girl needs to earn a handicap of 12.99 or better to score 10 points for her team. NASTAR racers earn a handicap or score based on their ability each time they race (platinum, gold, silver, bronze or no medal earned). The handicap chart shows a handicap range for each medal group. The minimum and maximum number of team points available is listed on the bottom of the chart. Team members score points based on where their handicap lies between the minimum and maximum range. NASTAR Team points are calculated based on a process of interpolation.